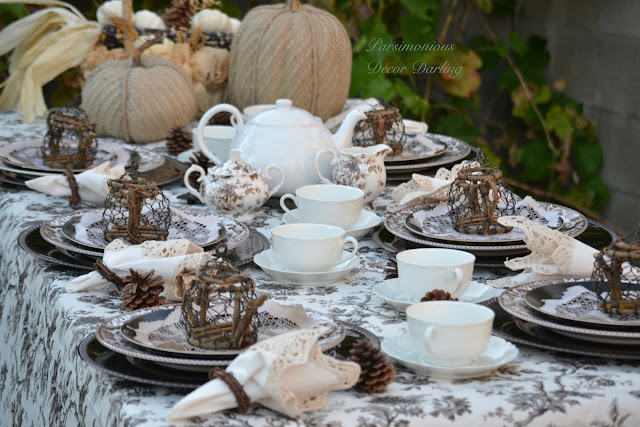 It's all about tea at Five Star Frou-Frou this week. Sherry from The Charm of Home shared her gorgeous Breast Cancer Surivor Tribute Tea seen above... ...and over at Parsimonious Décor Darling, we were treated to a stunning Fall display featuring twig and wire teapots.... ...and finally, Lynn at Quaker Hill Farm, shared this darling vignette and her mouthwatering recipe for Apple Pear Spiced Tea...I'll be right over Lynn...yum! I'm dizzy with teatime possibilities now! Hi Mimi, I do believe this is my first time linking to your party, but it certainly won't be the last! Thank you for sharing this platform for all of us to visit and enjoy each's interests and work. Thanks for hosting the fun party. I love the tea theme for features. I linked up an easy way to make apple pie. I do hope that you will join our Cooking and Crafting with J & J Link Up on Monday. Thank you for the invite, I appreciate it very much!! Have a great weekend! Mimi, it is always nice to visit you at your party. It's like visiting a good friend. Thank you for hosting and have a great weekend. Hi, Mimi! Thanks for hosting one more week! Have a spooky weekend! Thanks for the party and hosting....my first time joining in on the fun! I found you through 24 Cottomwood Lane. You passed. you use a good platform!!! LOL. Thanks so much for hosting Mimi. I appreciate the feature! I am always about tea! Hope you are having a lovely weekend!